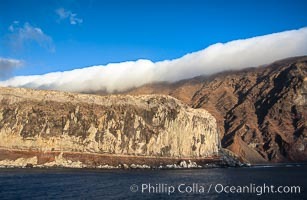 A sheer ridge, the crest of an ancient caldera, forms the highest point on Guadalupe Island at its north end. The crest creates its own weather in such a way that clouds, trapped on its west side, drape over the top of the island and dissapate as they flow down the east side. The moisture from these clouds supports a small fragile grove of Monterey pines (Pinus radiata), one of only two island populations of this tree species in the world.